One thing I love about blogging my sewing projects is that I get to see how they look naturally instead of how I imagine them in my head or see them in the mirror. (I use the term "naturally" loosely since these are completely posed selfies shot with a remote by yours truly.) 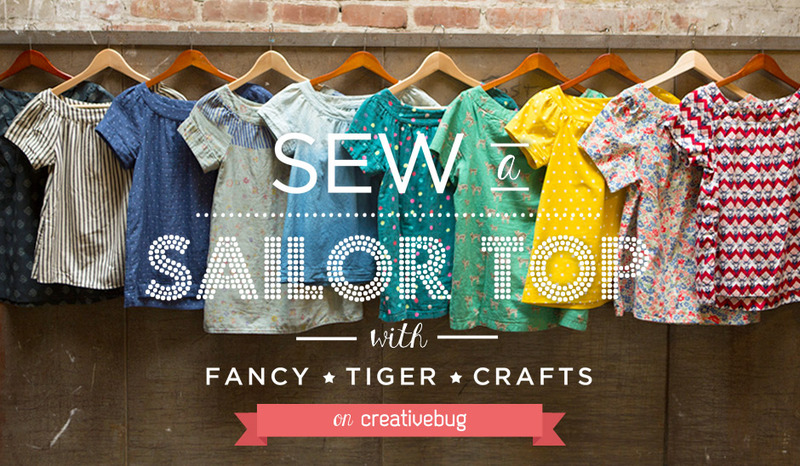 I actually wasn't crazy about this Fancy Tiger Sailor Top when I first sewed it, and I had mostly forgotten about it since it was on display at Modern Domestic advertising a class I taught there a few months back. So when I got an email from the owner to come pick it up, I was a little "meh" about it. I mean...it's a cute top. It's been a popular pattern. But just looking at it on the hanger? It felt a little frumpy to me. Too oversized. Not my style. So I was fully prepared to photograph and blog it anyway and basically say that I wasn't crazy about the style. These photos happened! And I now love this top! And the fabric! And the color! As my daughter would say, "Everything is awesome!" I made this top in a medium because I didn't want it to be too tight across the shoulders/under the arms, and I think it's perfect. I do, however, prefer my tops to be on the looser side. Someone who wants a more fitted look might want to err on the small side or grade down at the hem since it is quite full around the hips. For your pattern-size-decision reference, I am about 36" in the bust at the moment, and I am 5'6" tall. I used the paper pattern, and I found it to be professionally drafted, well illustrated and easy-to-follow. I used French seams at the side and armholes and stitched the yoke in-the-ditch to finish. In retrospect, I wish I had taken the time to hand sew it. Sometimes, my ditch stitching is spot-on, and other times, not-so-much. This was one of those not-so-much times, but I'm cool with that. Finished is better than perfect, ya know? And the fact is that this would still be languishing in the WIP pile if I'd decided to hand stitch it. The only odd thing about this top is that the yoke, despite being the same width all the way around in the pattern, seems to narrow at the shoulders when sewn. You can see this effect in the photo below. I'm guessing that's because that curve is on-the-bias? I recommend interfacing the yoke with a lightweight fusible to prevent such distortion - especially if using a fabric like double gauze or challis that tends to get a bit distorted even in the best of circumstances. The fabric is a lovely Japanese double gauze for which I unfortunately couldn't find an online source. (If you have one, please leave it in the comments so I can add it!) I honestly don't love sewing garments with double gauze because of its tendency to wrinkle, but this one seems slightly more crisp than some others I've worked with. It still has fabulous drape though and is heavenly against the skin. I'm so happy I snapped these shots and got to see this top in a different light. It's a perfect addition to my daily momiform, and I'm sure it will get a ton of wear now and with a cardigan in the fall/winter. What do you think? Have you ever written off a garment as "not your style" but then changed your mind?